So last night Mattie wanted Mark to take her for her walk. For a few years now she has needed special daddy daughter time alone when Mark gets home from work. It doesn’t have to be much but she demands it until she gets it. Alas last night Mark wasn’t feeling well so I said I would take the Wildlife out and hopefully satisfy her with something. We headed out and down the front steps and there were deer right out in front. Hadn’t seen any on the island in a little bit except the new baby I posted. When I suddenly noticed that there was a baby gamboling about the others in the grass. I then realized that this was the only time in forever I left the condo without my phone. The need for a picture was immense. So we ran back to the room, got my phone and came back out hoping all was still ok. Alas we got back as another lady came out with a dog to feed the deer and then another lady was walking by and Sam decided he needed to bark. I could have screamed. The fawn darted off into the underbrush along the edge of the dry lakebed. I was so upset with Sam. I told them we were not returning home till I saw it again. So we moved down and about. The Wildlife not totally happy with a mom that was controlling their movements which weren’t where they were wanting to go. We waited and moved again. Ever so quietly. They really did get into the quiet tiptoeing. 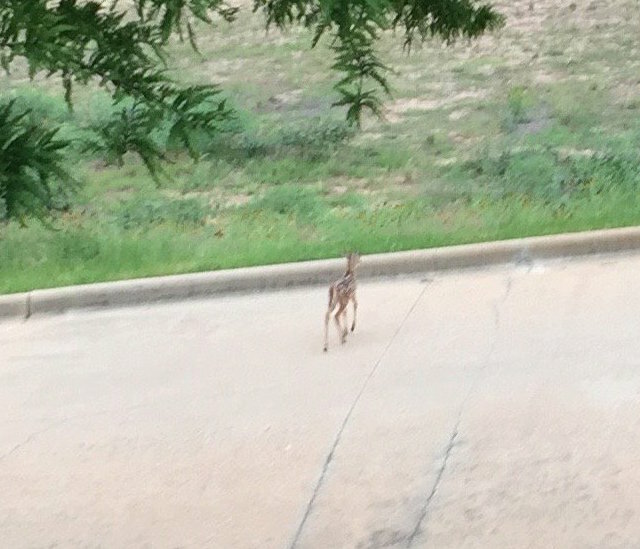 The fawn that didn’t want to wait and see if Sam was friend or foe. Finally over the edge I saw a baby again. We followed along top and I so wanted a picture but knew it was too far off to be good. So as they moseyed down the way we did as well. Soon we came to the stairs and ventured down. 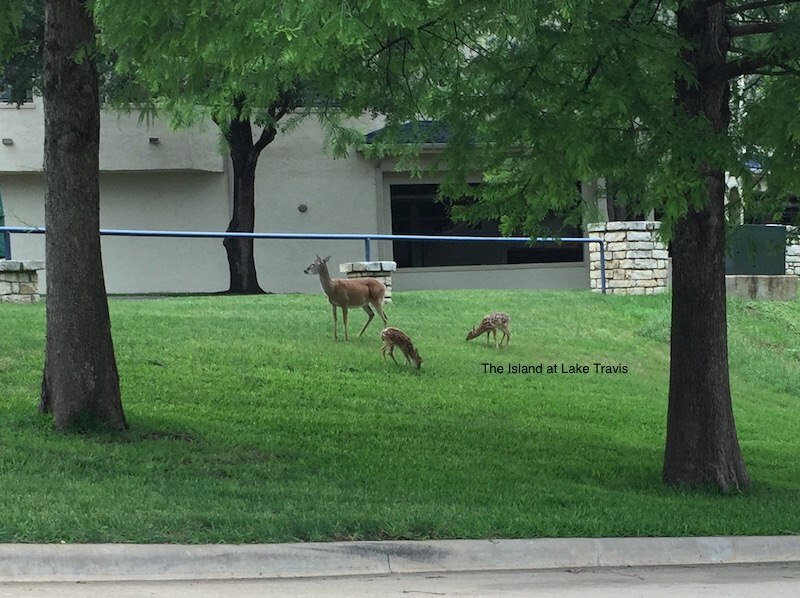 Now these deer are generally not afraid of people but I didn’t know what would be the game with the baby. The baby!!! There actually were two. One doe (there were 6 does and two bucks in the group) actually had two fawns following her. Feeding from her. They kept moving a bit further along. So we followed tiptoeing along. We made it down to the end and around and followed them up the stairs and then when we got to the top they were back down below but this time I could get a decent enough picture. Snap. We got it. Sam and Mattie we can go home now. 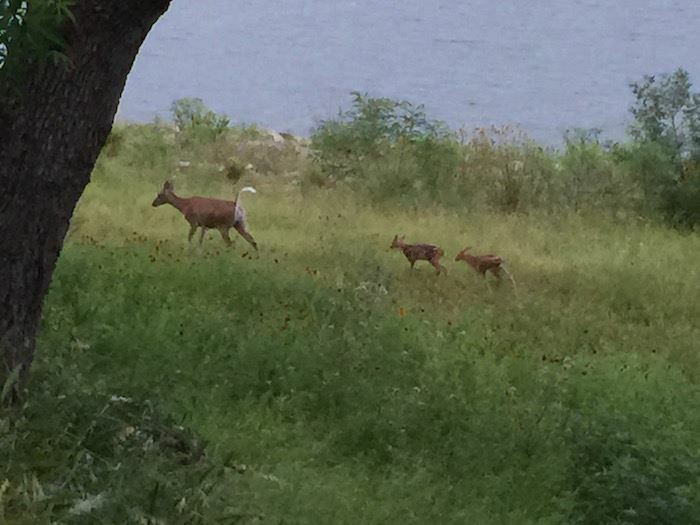 The doe and her twins. Boy did I learn a lesson in this long waiting period. If I had my phone in the beginning, would I have stayed around long enough to know there were two babies? If Sam hadn’t barked when we returned, would we have ever seen that there were two babies with one mother? Would I still be wondering about deer twinning. Who knew! So when things are not going as you want. Not in the time frame you want. God often says to just wait. The best is yet to come. It is so often hard to be patient in the wait, but oh who can deny the excitement when the wait reveals something even better than you imagined. Taken a couple days later.